I know, comfortable ways out of the comfort zone sounds a bit like a paradox, but I want to emphasize that you don’t have to start bungee-jumping in order to get out of your comfort zone. It’s not that melodramatic and it’s not that clever either. What you want to do is create a well-balanced life where you learn and grow continuously being on the border of your comfort zone. The comfort zone is the area of your life where you just feel comfortable at, because your current skill set allows you to easily navigate within that area. For instance you are very comfortable with your daily schedule, but you want to get more energy and be fit. Doing regular exercise moves you out of your current comfort zone and helps you reach your goal of being fitter. Another example where you are very comfortable with is probably the way you work day-in and day-out. But imagine someone likes your work and invites you to speak about it in front of 1,000 people. That could potentially pull you out of your comfort zone big time. It could even create some anxiety in you. It’s not necessarily wise to go into the panic zone. 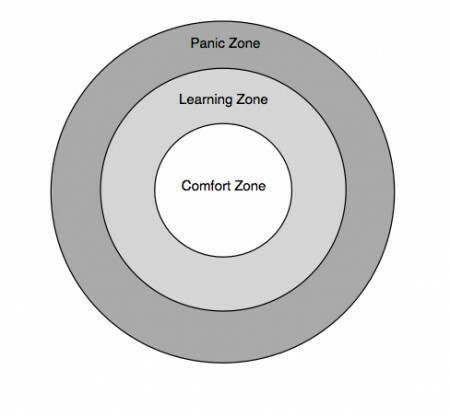 The best way to grow your comfort zone is to stay within the learning zone or at the edge between learning and panic zone. You can go into the panic zone, and it can potentially create rapid growth and accelerate your learning massively, but it’s also likely that you could experience this as a negative experience. It all depends on how well you can handle these situations. The panic zone is where your current skill set is nowhere near the level that is needed. If you are afraid of speaking in public and haven’t done it in your life yet, doing a speech in front of 1,000 people will move you into your panic zone. Of course it depends on how well you handle the situation and how you work with the feedback you get. But in general, going into the learning zone is the right approach. That’s one of the easiest and most fun way to grow continuously is to learn something new every day. Make it a habit to feed your mind on a regular basis with exactly the interesting knowledge you are passionate about. Try to find the best knowledge there is in your chosen field. Then while learning try to use this knowledge and integrate it into your life. Traveling and getting to know a new culture and new people is a great way to broaden your perspective and to grow. Maybe take a look at the map and decide your next destination right now. Setting goals is an essential part to stimulating your own personal growth. A good goal will pull you out of the comfort zone and will help you to reach something new which is at the border of your current horizon. Goals work so well because they focus your mind on a new reality and create a natural pull towards creating this reality. Getting to know new people and growing your circle of friends will always be enriching to your life. Look for people who are somewhat different than your current friends, but not necessarily too far away from what works for you. They will create new experiences for you while you still go along fine with them. There is a reason why you are putting your obvious and probably most important task off. And this reason is probably linked to some kind of fear of what might happen afterwards. You have to face your fears in order to grow as a human being, not hide behind them. 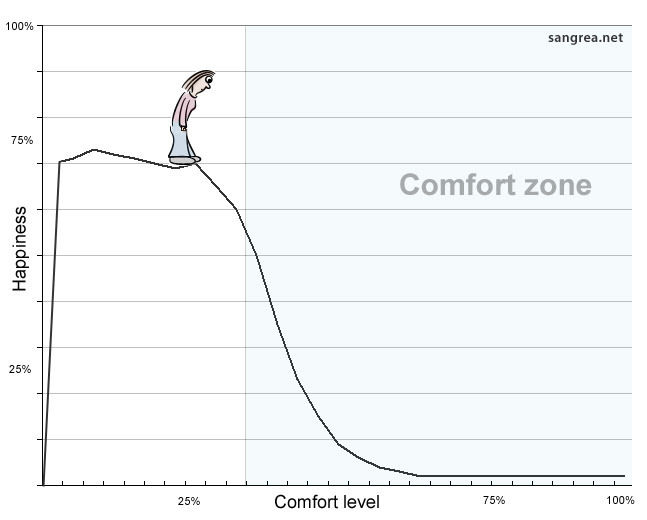 Being outside your comfort zone raises your level of happiness unless your comfort level gets in the red panic zone. I’m curious about how you personally get out of your comfort zone. Hit the leave a comment button below after writing your comment and let me know. Thank you very much.This article is very helpful for me. The situation you have explained of the panic zone, learning zone and comfort zone is really match the situation and explains well. I doing an exchange year and I realized, that I have left my comfort zone when I was here. Like, really experienced it. But I don’t regret it, it made and still makes me more secure and independent. I know that I will return to my comfort zone at some point, but I think after a little resting, I will start again to learn and discover new things! Thank you very much, Mirko, your article expressed, what I felt in the last weeks. in some way i need to your words ! Sounds great Helen, you’re right on track! I really enjoyed the content of your post and found it extremely timely as I have just recently started to challenge myself more by moving out of my comfort zone. In the past month I have experienced moving out of my comfort zone in all of the five areas you covered, so you have given me a real boost to know that I am moving forward. Thank you Myrko. I enjoyed and found it useful looking at your work here. I recently read a book that had a line in it that really helped me understand why moving out of our comfort zone can be difficult. The Author, Stephen Grosz, suggests that change and loss are deeply connected – there cannot be change without loss. Thanks for sharing your work. Your whole blog rocks and will be returning for more information.Keep up the great work. That’s great to hear, Michael! I think being outside your comfort zone doesnt need to be scary. When you learn something new and apply it you are already “outside” in the learning zone. @Sam Boustani: Sounds like you are just outside of your comfort zone, in the learning zone! Thanks for the feedback.. I have joined different groups on Meetup.com and have been attending events. I would never have done this before because I usually hang out with a small circle of friends, but I found myself lonely because the few friends that I had were always busy. I am now meeting new people and making new connections. This is VERY uncomfortable, walking into a pub and sitting at a table with 15-20 strangers. But I always find it rewarding and am always happy to have done it. I have a happy hour with 22 people tomorrow! I have been learning to get out of my comfort zone by breaking down what I want to do into actionable tasks. I have all these things in my head (mainly big projects) that look insurmountable. While they float around in my head they cause stress because so many tasks are undefined and my brain is trying to figure it all out. Nothing gets down. I started writing down my projects on paper and sub-projects under each one all the way down to individual actionable items. I then put these into a system that I can use daily (Evernote in this case) and use that as a productivity tool. Getting all of these things out of my head clears my mind to focus on the next task that needs to be done, which is defined in my list. I found this better than a “to-do” list because they are not just listed as projects, but as action items. Most of this system I learned from a book titled Getting Things Done by David Allen. @Felix Mack: Thanks, yeah indeed it’s a learning experience. You get used to a good habit doing it by just learning new things regularly, which will let you grow without much effort. Great insight and advice Myrko. On a weekly basis, I look for opportunities to get out of my comfort zone. It is a learning experience…and after a while, the comfort zone expands. Thanks for another good post! Thanks Dan. 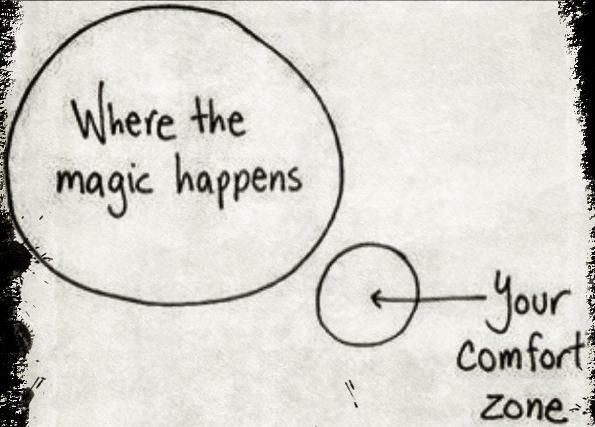 I think the key takeaway here is that it doesn’t have to be hard to be outside your comfort zone. 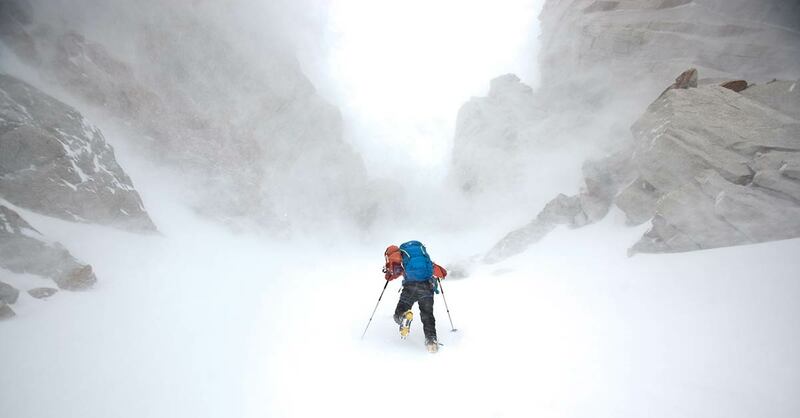 On the contrary, it can feel fun and therefore almost effortless. Another great article Myrko. I am definitely going to use some of these tactics. We all find ourselves drifting back to our comfort zone now and again.